Many crops are sensitive to early-season competition from weeds, so minimizing risk by reducing weed density is crucial. 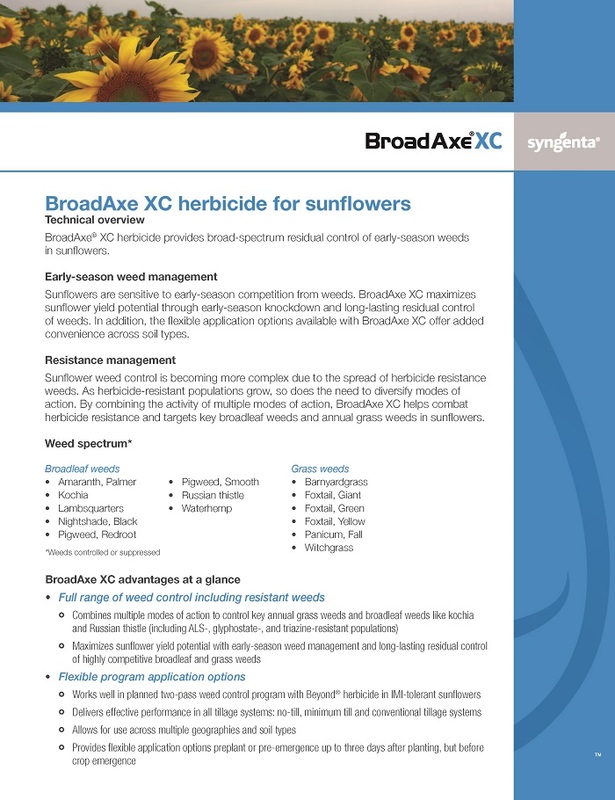 BroadAxe® XC herbicide maximizes soybean, sunflower and dry shelled pea yield potential through early-season weed management and long-lasting residual control of weeds, with flexible application options. Using multiple effective sites of action, BroadAxe XC promotes the use of overlapping residuals to delay herbicide resistance and provide highly effective, season-long weed management. 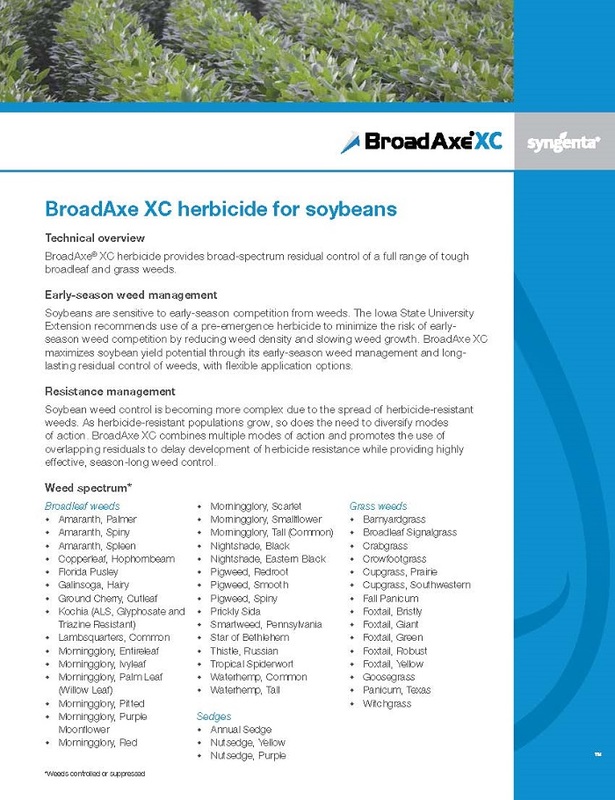 In soybeans, BroadAxe XC applied pre-emergence fits under any trait platform and can be followed by approved dicamba products, glufosinate or Flexstar® GT 3.5 herbicide. Flexstar GT 3.5 is formulated to combat weeds that are difficult to control with glyphosate alone or are resistant to glyphosate and ALS inhibitors. 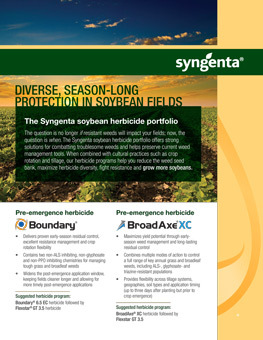 BroadAxe XC is one of several Syngenta herbicide tank-mix options available for inclusion with XtendiMax® with VaporGrip® Technology, Engenia® herbicide and FeXapan™ herbicide Plus VaporGrip Technology. Tank mixing with dicamba provides you with additional weed management options and resistance management benefits. Please visit the XtendiMax application requirements, Engenia tank mix and FeXapan tank mix pages for approved drift reduction agents. Flexstar® and the Syngenta logo are registered trademarks of a Syngenta Group Company. Third party trademarks are the property of their respective owners.